My Little Pony: A Very Minty Christmas , a film for all ages... under eight. Yes folks, I recently watched a My Little Pony DVD. Don't ask why. I don't have to explain myself and I don't intend to, so just accept it. First off, I've gotta tell you about the packaging. This single DVD comes in a typical plastic DVD case which is placed inside an outer box about the size of three standard DVD cases stacked on top of each other. Toward the top of a box is a small window displaying a small My Little Pony figurine of the title character, Minty. This is actually a cute little figurine which is made of a durable-feeling plastic, not some cheap piece of crap like one might expect. On top of her hard, pink hair sits a soft Santa hat, which is a separate piece from the figurine and actually feels like a Santa hat. Unlike the real hats, however, this one has a clear, transparent plastic strap to keep it on the little pony's head. So I guess you could even take if off if you wanted to. I have to admit, this is a pretty cool pack in. Not that I'm a My Little Pony fan or anything, but this thing is just so adorable looking, I would have no problem placing it on or near my computer monitor. The thickness of the packaging is obviously necessary to fit in this little figurine, but I was kind of expecting to find something else in the area underneath where the pony sits, not just empty space. They really could have put something here, even it if was something that you unfold and then cut out to make a little cardboard house for Minty. I guess after coming up with the figurine pack-in idea, everyone was just pooped. Anyway, so on to the cartoon! Christmas time is near, and the My Little Ponies are cooking up a special candy cane that supposedly allows Santa to find the My Little Pony's town through all of the thick clouds. They call it the "here comes Christmas candy cane", and once it's made they place it on the tippy top of the giant Christmas tree that's out in the middle of town. All of the Little Ponies turn out to the ceremony of placing the candy cane on the tree, and everyone is happy. But Minty apparently has some sort of OCD or something, because she can't help but take up a hot air balloon to the tippy top of the Christmas tree, even though she's not very good at piloting a hot air balloon, just to make some minute adjustments to the candy cane. It becomes pretty clear what's going to happen as soon as she starts doing this, but she is blinded by her desire for perfection. And yep, then it happens, the candy cane falls and breaks into teensy tiny little pieces. Minty feels terrible about what she's done, and rightly so. But, she doesn't try to cover it up. She actually tries several times to tell her friends what she did, but they're all so busy that none of them listen to her. Thus, after a quick brainstorming session with herself, she comes up with the bright idea to become Santa Claus, since without the candy cane Santa won't be able to find Ponyville (or whatever the name of their town is). It's actually a very sweet gesture, as she decided to give each of her pony pals one of her very precious socks. Of course, he plan doesn't quite work out as expected, and when she's caught, she explains what happened and realizes the only way to make up for what she's done is to head to the North Pole and guide Santa to the village herself. Thistle Whistle, a pegasus pony with a scaredy-cat attitude, reluctantly follows her, which is another great moral. She was scared, but knew that her friend needed help so she faced her fear and did it anyway. There are actually a lot of good morals found in this cartoon, and the entire story is without any major conflict at all. Kind of amazing if you ask me. There is a second episode on this disc which does the same thing, so my hat is off to the writers. It must be extremely difficult to write stories with little-to-no conflict. The other episode actually takes place chronologically before the Christmas episode, as that's when Star Catcher' first meets the pegasas pony Sky Wishes, whereas Sky Wishes appears in the Christmas special like she's part of the group. Yeah, this is sickeningly sweet, but I think it would be a great cartoon for little kids. And I really liked the cut little figuring pack-in. As for bonus features, there are two songs that appear in the special that can be played independently, without having to search for them in the episode. I would liked to have seen some kind of history of the My Little Ponies, as after watching this I must admit I was curious. But all-in-all, I think it's a good release. 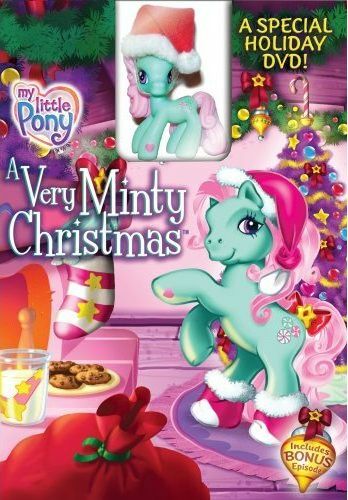 My Little Pony: A Very Minty Christmas , released by 20th Century Fox, is available starting October 21, 2008.